When we got our new dining table a few people asked me about what chairs we put with it. At the time, I didn't know what we were going to do. We had 2 different sets of chairs and were trying to figure out how we'd sell our other table...and which chairs we'd sell with it. The old table was fine. I bought it when I was single and it was great for a long time. Before kids. It was a polished wood table and scratched easily. Not the best for little ones who seemed to scratch it just by looking at it. An 'off limits' kind of dining room is not workable in our house so we had to get a table that would stand up to the kiddos. We love the rough Pottery Barn table we got, but since we splurged on it, there wasn't anything left in the budget to buy a new set of chairs. We Craigslisted the other table and included the wood chairs that I had with it. They had white seats which was also a no-no with kids. We kept four upholstered chairs. Two with arms, two without. I liked the stripey fabric on the chairs, but the tan/brown tones didn't mesh well with the newly painted gray dining room walls. I knew I had to cover them. There were dozens of other inspiration pictures that made me want to make my own slipcovers for the chairs and then paint them. So, I got some white canvas fabric and started working on covering those stripes up. I took these pictures last February, whoa, it was a whole year ago! I had planned on putting together a tutorial because I was really happy with how the covers turned out. But...I ended up scrapping the ones I made when I found another alternative. I finished the covers for one whole chair and then did the back on another one. THEN, I found these. 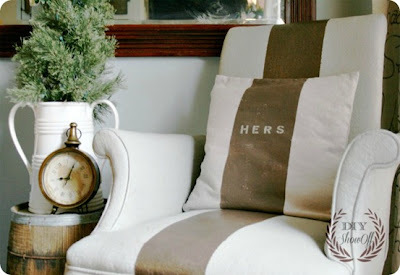 I found these slipcovers from World Market and, even though they have a strong pattern and are almost 'ugly' I thought they'd be perfect for the chairs. They pretty much have a shade of all the colors in the house and thanks to a great coupon, gift card, and sale...they were cheap! Plus, the practical side of me decided that I was living in fantasy-land thinking that white chairs would stay white with 4 small kids around. I tucked the white covers and fabric away for the future. I can always get them out and finish them for a holiday or something. I had fun plans for painting them once they were done. I'd still like to do it...someday. So these covers solved the problem of 4 of the chairs. Although, I still have some things to finish, like cutting a hole in the side of the fabric covers so I can reattach the chair arms. Right now they are looking lovely with the arms hanging down. (hopefully you can sense the sarcasm) Pretty, right? Obviously, 4 chairs is not enough for this family. We wanted something that could get tucked out of the way for the side of the table we walk by the most. Pottery Barn sells a bench that goes with the table that was perfect and, thanks to a special promotion that gave us money back on the table...we spent the money 'saved' on the matching bench. After we got the bench, I found the cushion on the clearance section of PB for only $20! It's been stained and marked with pen already (Henry is a pen-fanatic), but it's cushy and works for the kids' side of the table. Oh, and you can see the dining room rug in the picture above. It's from Pottery Barn too. It's an outdoor rug (aka - you can hose it down when needed) and it has held up really well under the table. I wish we could buy a nice rug pad that keeps it down on the ends a little better (you know the fancy ones that grip the floor and the rug), but they're almost the same price as a whole new rug so it's hard for me to justify getting one.